Pretoria University, Venda University, University of Port Elizabeth, University of the Western Cape, Technikon Northern Gauteng, Border Technikon - East London, Vaal Triangle Technikon Vanderbijlpark, Vaal Triangle Secunda, Vaal Careers College, St Stithians Collegiate Johannesburg, St Mary's College Kloof, St Andrews College Grahamstown, The American International School of Johannesburg, Rhodean School Johannesburg, Bishops Diocesan Cape Town and Hilton College in Kwazulu Natal. 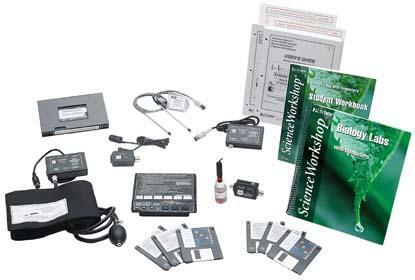 The ScienceWorkshop Biology Bundle provides sensors to perform 14 of the 18 documented experiments in the Biology Teacher's Guide. Your students can perform experiments ranging from monitoring a heart rate to more complex cellular respiration. The 18 documented experiments in the Biology Teacher's Guide include: Relationships between Plants and Animals, The Role of Buffers in Biological Systems, Insulating Properties of Water and Soil, Anaerobic Cellular Respiration, Energy Content of Foods, Regulation of Body Heat, Exercise and Pulse Rate, Membrane Permeability, Organisms and pH, Catalase Activity, Acid Rain.